IPM is very happy to bring you this story of US participation confirmed and moving forward for Yeosu Expo 2012. The creative team includes Andrew Snowhite, Robert Ward and The Hettema Group. “Secretary of State Hillary Rodham Clinton today announced that the United States will participate in the Expo 2012 Yeosu Korea during a State Luncheon at the U.S. Department of State in honor of Republic of Korea President Lee Myung-bak. Participation in this Expo demonstrates U.S. commitment to strengthening U.S. – ROK relations and engagement in the Asia-Pacific region and deepens our friendly ties with the people of the Republic of Korea. 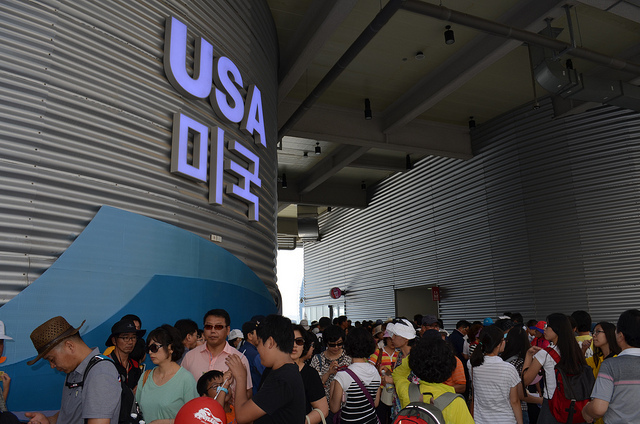 “The Secretary noted that the United States is pleased to be participating in the 2012 Expo Yeosu Korea, which will officially open May 12 and run through August 12, 2012. Several million visitors are expected to attend and 108 countries and international organizations are expected to participate. “Following the State Luncheon, Secretary Clinton was joined by Vice President Joseph Biden, Jr., Republic of Korea President Lee Myung-bak, Republic of Korea Foreign Minister Kim Sung-hwan, Republic of Korea Ambassador to the United States Han Duk-soo, Assistant Secretary Ann Stock, Assistant Secretary Kurt Campbell, and USA Pavilion 2012 Chief Spokesperson Philippe Cousteau, Jr. to celebrate the announcement of U.S. participation in the Expo 2012 Yeosu, at the Department of State. “Secretary Clinton thanked the corporate sponsors of USA Pavilion 2012, which is a public-private partnership, for their generous donations. Corporate sponsors include: Chevron; Citi; Boeing; Corning Incorporated; Hyundai Motor Company; Kia Motors America; Lockheed Martin; Samsung Electronics America, Inc.; GE; and Becton Dickinson. The management team of USA Pavilion 2012 combines a range of experiences from the nonprofit and commercial arenas with a world famous legacy of exploration and environmental stewardship. Members of the creative team headed by Andrew Snowhite include Robert Ward and The Hettema Group. For more information about the USA Pavilion 2012, visit www.pavilion2012.org.